Bajaj launched their flagship product, the Dominar 400, in India some time back. Bajaj markets it as a sports tourer and challenges the Royal Enfield bikes in the market that are widely preferred by the long-distance touring enthusiasts. However, over the time, the Bajaj Dominar 400 could not really get a grip in the segment and the sales are not anywhere near the Royal Enfield models. The Dominar is an extremely value-for-money bike and offers a longer feature list than any of the Royal Enfield bikes. 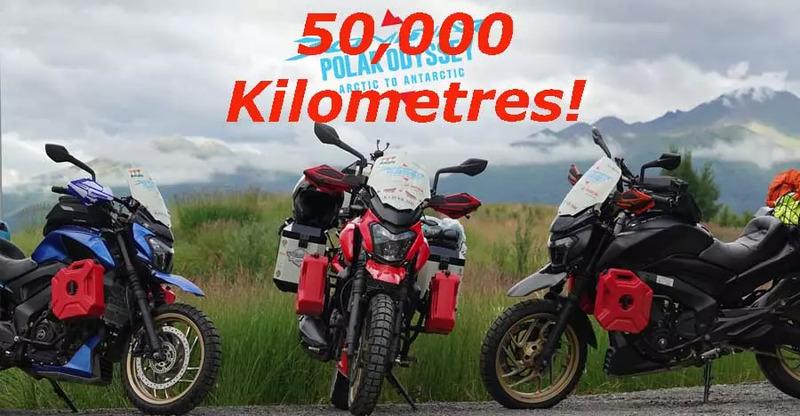 To show off its long-distance riding ability, three Bajaj Dominar bikes will ride from the North Pole to the South Pole of the planet. Three passionate motorcyclists – Deepak Kamath, Avinash PS and Deepak Gupta – will take on this daunting task. Kamath is an experienced rider and has been riding motorcycles for the last 30 years. He was also a part of the Trans-Siberian Odyssey. Avish PS is a mechanical engineer and is a passionate biker and a photographer. Deepak Gupta is an enthusiast who holds a good amount of riding experience against his name. Bajaj has officially released a video of the journey that was flagged off a few days back. All the three Dominar bikes have been heavily modified for the gruelling journey. The group of three will cover 50,000 km in about 4 months and will cross 17 countries in North America and South America. On an average, the riders will travel 450 km daily, which is quite gruesome for the travellers. The journey from the North Pole to the South Pole will see the bikes going through some of the most extreme climate conditions in the planet. Even though a group of riders completed the Trans-Siberian ride on the Dominar a few months back, this will be a different ballgame altogether. The terrain will include icy surfaces, tropical climates and no proper roads at a few places. The Dominars will also go through Canada and the USA, experiencing one of the best roads on the planet. The ride has already started and in about four months from now, the group is expected to reach their destination in the South Pole. The riders will be travelling without any support crew, which makes the journey even more difficult.